In last few years, thanks to laser technology with minimally invasive approach, there was a growing need for treatment of oral vascular malformations inside the dental offices. Generally, the diagnosis of oral vascular malformations is based on clinical history, clinical examination and imaging exams. In the present paper, we review, researching by PubMed, the technical aspects, clinical indications, potentialities and limitations of color-Doppler ultrasound in the work-up of oral vascular malformations. Different imaging modalities are encountered for the diagnosis and follow-up of these lesions such as computed tomography, magnetic resonance imaging, color-Doppler ultrasound and angiography. To date, color-Doppler ultrasound is considered the first-line imaging approach since it provides a non-invasive, cost effective, real time evaluation of oral vascular anomalies. It provides both morphological and vascular information, which are useful to determine the best therapeutic options. Ultrasonography, for these reasons, could be considered as a valuable diagnostic tool in the preliminary assessment of oral vascular anomalies. Background: Plagiarism is stealing of some others work or idea without proper citation. It is one of the biggest challenges faced by the scholarly world and by far a grim form of delinquency in academics. Aim: The study was designed to explore the knowledge and attitudes of dental professionals toward plagiarism. Materials and Methods: A questionnaire having 14 questions was sent either via e-mails or by sending printed copies to 5000 dental professionals, while maintaining anonymity of all the participants. Result: Most of the dental professionals know about plagiarism, and they believe that plagiarism cannot be avoided successfully. Pressure to publish was a major reason along with several others, which accounts for more and more indulgence in plagiarism. At the same time lack of facilities in private institutions and lack of funding for research work were the major factors as well, which hinder in creating research environment and hence promotes plagiarism and false studies to publish it. Conclusion: Plagiarism is present in dental professionals and that significant reduction can only be brought by awareness, objective check methods and stringent punishment. Plagiarism and other forms of academic misconduct must be recognized and must not be tolerated. Background: The impact of prehospital intubation (PHI) in improving outcome of trauma patients has not been adequately evaluated in the developing countries. Aims: The present study analyzed the outcome of PHI versus emergency room intubation (ERI) among trauma patients in Qatar. Materials and Methods: Data were retrospectively reviewed for all intubated trauma patients between 2010 and 2011. 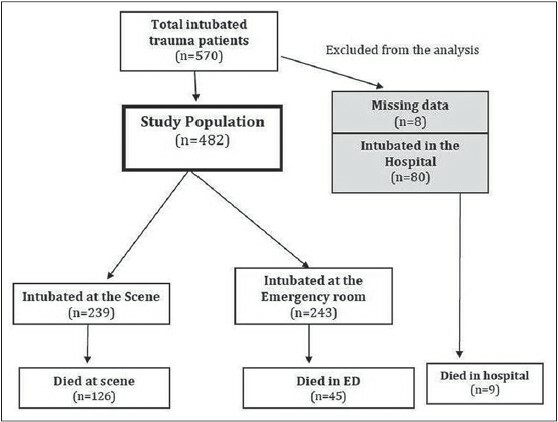 Patients were classified according to location of intubation (PHI: Group-1 versus ERI: Group-2). Data were analyzed and compared. 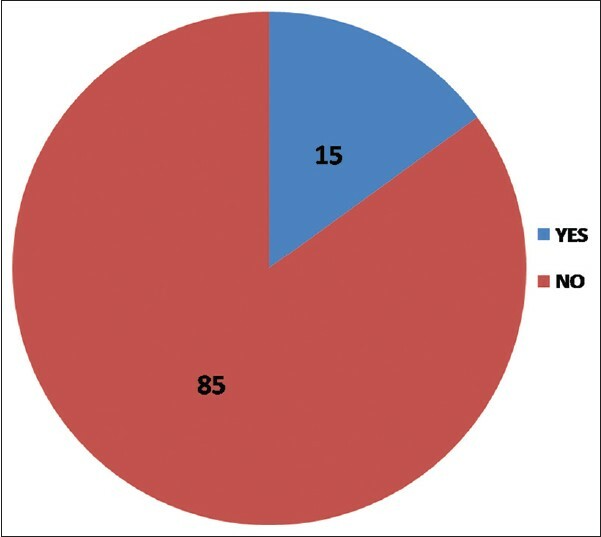 Results: Out of 570 intubated patients; 482 patients (239 in group-1 and 243 in group-2) met the inclusion criteria with a mean age of 32 ΁ 14.6 years Head injury (P = 0.003) and multiple trauma (P = 0.004) were more prevalent in group-1, whereas solid organ injury predominated in group-2 (P = 0.02). Group-1 had significantly higher mean injury severity scoring (ISS), lower Glasgow coma scale (GCS), greater head abbreviated injury score and longer activation, response, scene and total emergency medical services times. The mortality was higher in group-1 (53% vs. 18.5%; P = 0.001). Multivariate analysis showed that GCS [odds ratio (OR) 0.78, P = 0.005) and ISS (OR 1.12, P = 0.001) were independent predictors of mortality. Conclusions: PHI is associated with high mortality when compared with ERI. However, selection bias cannot be ruled out and therefore, PHI needs further critical assessment in Qatar. Background: Usually the chest tube removal (CTR) has been described as one of the worst experiences by patients in the intensive care unit. 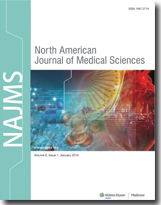 Aim: This study aimed to compare the effects of cold therapy and relaxation on pain of CTR among the patients undergoes coronary artery bypass graft surgery. Materials and Methods: This single-blinded clinical trial was done on 80 post-cardiac surgery patients in the heart hospital of Sari-Iran. The patients were assigned to three randomized groups that included cold therapy, relaxation, and control groups. Data analysis was done by T-test, Chi-square, generalized estimating equations and repeated measures analysis variance tests. Results: The groups had no significant differences in pain intensity before CTR (P = 0.84), but immediately after CTR there was a significant difference between the treatment (cold application and relaxation groups) and control groups (P = 0.001). There was no significant difference between relaxation and cold therapy groups. 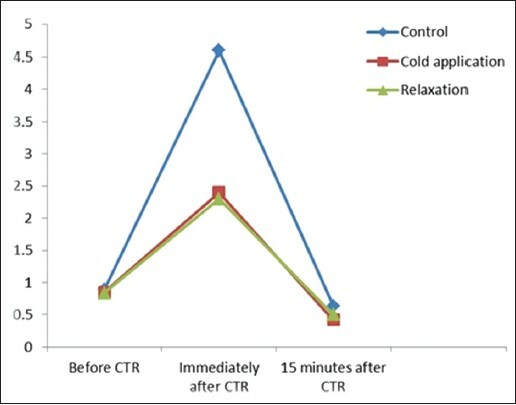 Conclusion: Regarding the relaxation and cold application methods showed relatively equal effects on reducing the pain owing to CTR. Thus, the use of relaxation because of economics, without side effects, easy to use and effective is recommended by the authors to the practitioners. Background: Trichomonas vaginalis, Gardrenella vaginalis, and Candida sp are responsible for 90% of vaginitis which has been reported as important risk factors for cervical cancer. Aim: This study aimed to find the prevalence of T. vaginalis, Candida sp, and G. vaginalis in women attended the cancer clinic charity, Babol, Iran and to identify the associated risk factors. Materials and Methods: This retrospective study carried out from 1996 to July 2012 on women who attended to a cancer screening program at the cancer clinics charity, Babol, Iran. Papanicolaou test and clinical examinations were performed for each woman. In addition to Papanicolaou test results, demographic data were collected. The data were analyzed with X 2 test using SPSS software, version 18. Results: In total, 2511 out of 33600 (7.5%) cases had vaginal infections. A total of 71 (0.2%), 2248 (6.7%), and 192 (0.6%) of subjects were infected by T. vaginalis, Candida sp, and Gardnerella, respectively. The highest rate of infection was seen in 20-30 and 30-40 years age group. The frequency of vaginal ulcers was higher in trichomoniasis (14.1%). Conclusion: This study demonstrated that the prevalence of T. vaginalis, Candida sp, and Gardnerella was low among the studied population. Moreover, malignant cytological alternations were not seen in any infected women. Background: Vertical sleeve gastrectomy (VSG) was originally performed as the first-stage of biliopancreatic diversion with duodenal switch (BPD/DS) for superobesity as a strategy to reduce perioperative complications and morbidity. VSG is now considered a definitive procedure because of its technical simplicity and promising outcomes. Aims: To analyze the outcomes of laparoscopic VSG and to compare them with those of single-stage laparoscopic BPD/DS. Materials and Methods: A retrospective review of 200 consecutive patients who underwent VSG and BPD/DS between 2008 and 2011. Results: A total of 100 patients underwent laparoscopic VSG and 100 patients underwent laparoscopic BPD/DS. The patients in VSG group were older, but gender distribution and body mass index were comparable. Mean operative time for VSG was significantly shorter compared with that of BPD/DS. A single patient in each groups required open conversion. Staple line leak (n = 1) and intraluminal hemorrhage into the newly-created sleeve (n = 1) occurred in the BPD/DS group. Mean length of stay was shorter after VSG (3.1 vs. 3.9 days). At 6 months postoperatively, excess weight loss between the two groups revealed statistically significant difference, favoring BPD/DS. Conclusions: Despite promising outcomes and technical simplicity of VSG, BPD/DS provides significantly superior excess weight loss in morbidly obese patients. Background: Research indicates that some children with autism spectrum disorder (ASD) experience a developmental regression. Aims: The study examined the percentage of children with autism, pervasive developmental disorder (PDD), ASD, and Asperger syndrome (AS) who were considered to be delayed (D), regressed (R), or delayed and later regressed (DR) and examined any relationship with autism severity, time of onset, factors associated with onset, gastrointestinal (GI) symptoms, race, age, and gender. Materials and Methods: The study reviewed developmental and medical information based on parental reports of 135 children with a diagnosis of autism, PDD, ASD, or AS. Results: The number of children in the D group was 53 (39.2%) with 19 (14.1%) in the DR group and 63 (46.7%) in the R group. Thus, 82 children (60.7%) were reported to have R. In regard to onset of symptoms, there was a significant difference between the D and R groups as well as between the DR and R groups. The analyses showed that there was no significant relationship between age, gender, race, severity, or GI symptoms and membership in any group; D, DR, or R. The majority of parents reported that the regression was preceded by or was associated with vaccinations (57.3%) or another medically related event (11.0%). Conclusions: The findings are consistent with previous research and reinforce our understanding of regression in those children with an ASD diagnosis. Background: The increase in invasive fungal infections (IFIs) in neonatal intensive care unit (NICU) is jeopardizing the survival of preterm neonates. Probiotics modulating the intestinal microflora of preterm neonates may minimize enteral fungal colonization. Aims: This study was to examine whether probiotic supplementation in neonates reduced fungal septicemia. 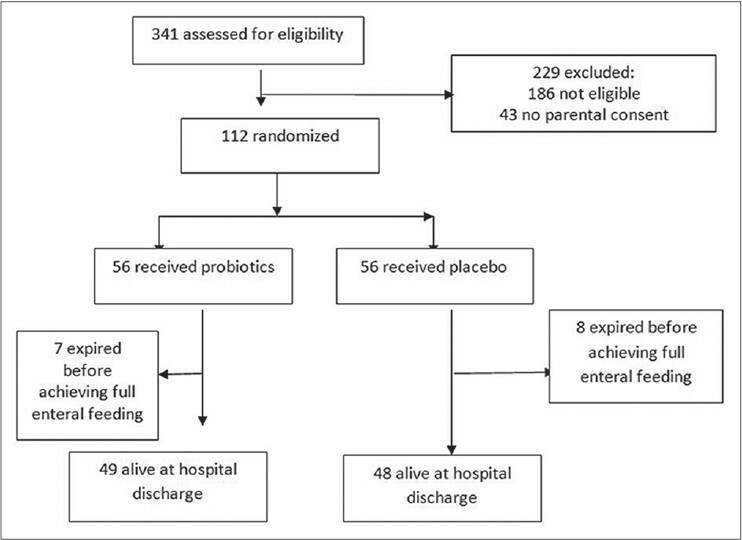 Materials and Methods: This prospective, randomized, double blind trial investigating the supplementation of preterm infants with a probiotic was done from May 2012 to April 2013, with 112 subjects randomized into two groups. Primary outcome: Decreased fungal colonization in gastrointestinal tract. Others: Incidence of late onset septicemia; duration of the primary hospital admission; number of days until full enteral feeds established. Results: Full feed establishment was earlier in probiotics group compared to placebo group (P = 0.016). The duration of hospitalization was less in the probiotic group (P = 0.002). 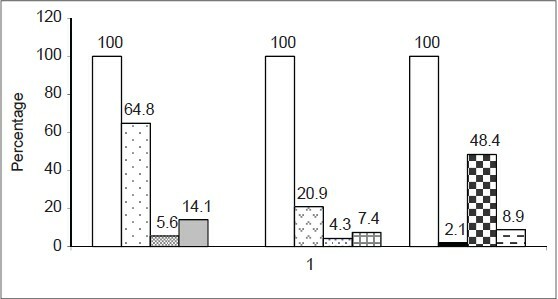 Stool fungal colonization, an important outcome parameter was 3.03 ± 2.33 × 10 5 colony formation units (CFU) in the probiotics group compared to 3 ± 1.5 × 10 5 CFU in the placebo group (P = 0.03). Fungal infection is less in the study group (P = 0.001). Conclusion: The key features of our study were reduced enteral fungal colonization, reduce invasive fungal sepsis, earlier establishment of full enteral feeds, and reduced duration of hospital stay in the probiotics group.